A few weeks before the Jakarta gubernatorial election, a series of photos on a newly built mosque on Jl. Daan Mogot, West Jakarta circulated in the social media. A group of Muslims (heretofore is the contra group) called the mosque had un-Islamic design. Since the incumbent governor is a non Muslim, rumors grew that he had purposefully designed the mosque to resemble a church. 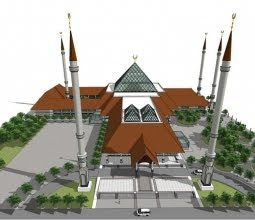 Being an architecture graduate and a Muslim, the first thing that crossed my mind regarding the argument was: what are the design elements of a mosque? What makes a particular architectural work be called a mosque? Before we get to that, how about if we take a look at the controversial mosque? Brace yourself, people, it's going to be quite a long post. 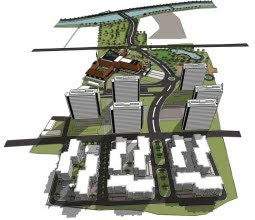 One of the concerns from the contra group was about the floor plan. They said that it resembled a cross, just like the medieval church floor plan. But here, as you can see, it's a simple T-shaped building. And the shape was used due to an even simpler reason: the shape of the land. As you can see, the land is kite-shaped, with several nodes encircling it. The architect must have taken two axis from two strongest nodes, put the building regulation and open space requirement into mind as well as optimizing the facade designs. 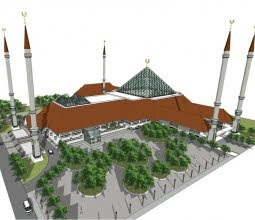 The mosque was designed by Adhi Moersid of Atelier Six, who had designed several mosques across Jakarta and one in Semarang, Central Java. All Atelier 6 designs have one strong concept: vernacular architecture. Wherever they build an architectural work, they will incorporate the local culture into the designs. And they apply it to this mosque too, because it has many Betawi elements. However, the contra group said that the ornaments were similar to the Star of David. Oh dear. All 3D CAD pics are taken from Atelier 6 website. There are many photos on this particular mosque in the Internet, you can check them out by typing in the keywords: Masjid Raya Daan Mogot. All mosques face qiblat, this goes without question. All Islamic praying space should be clear from dirt and other things that are considered impure in Islamic teaching, and you will be required to leave your shoes prior to entering the main building area. After removing the shoes, you will have to clean with water: your hands, face, nostrils, top of head, ear lobes, and feet. Now that you're clean, you are allowed to enter the prayer hall, an area where Muslims pray five times a day according to the solar schedule: dawn, midday, afternoon, dusk and night. Mihrab is a part of the prayer hall, where the imam, leader of praying activity, stands. It is usually ornately decorated according with calligraphy. If the mosque has enough space, usually there is a mimbar, a raised platform where clerics give sermons/speeches. To perform call for prayer. Of course, it is a mosque. There must be a praying activity held in the building. Just to give an idea what a mosque floor plan looks like, here are six mosque floor plans from early Ottoman period. 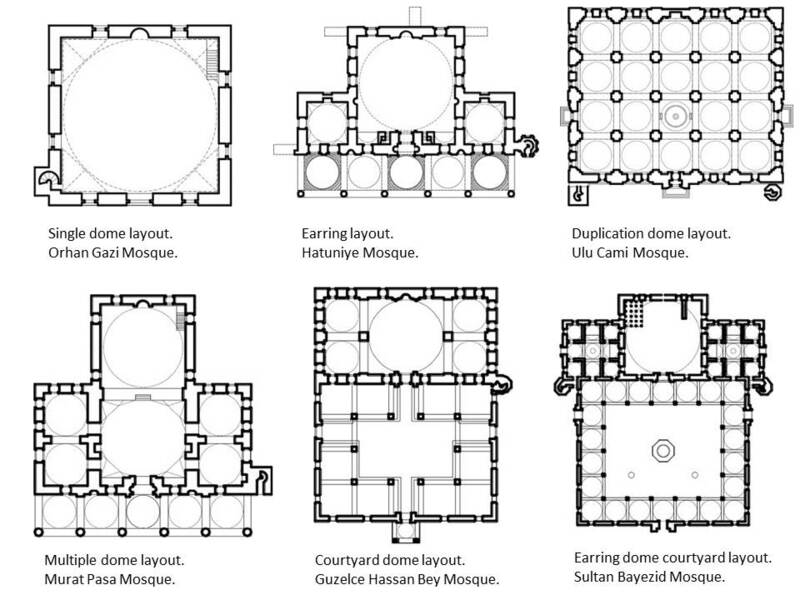 Source: Mosque layout design: An analytical study of mosque layouts in the early Ottoman period. As you can see from the pic above, there have been mosques using T-shaped floor plans. 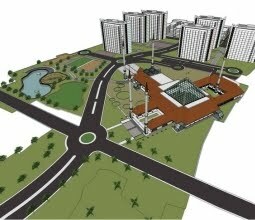 So what's the big deal about Masjid Raya Daan Mogot? I don't really understand what the argument was about. If the contra group dislikes the incumbent, can't they just not vote for him in the election? No need to spread fake news. For me, a mosque is a place to pray. But of course, Allah has created this Earth as a place to pray. So you can pray anywhere (except graveyard and toilet). Congratulations, you made it to the end of this post. I hope I don't bore you on the minutiae. PS. I've made several posts on the mosques in the past. You can check them here, here, here, and here. PPS. Have you checked an Instagram account called @placesyoullpray ? Go and have a look.